Jam City (formerly SGN) and Peanuts Worldwide announced the worldwide launch of Snoopy Pop, a free-to-play bubble-shooter starring characters from the popular Peanuts comic series created by Charles M. Schulz. The game challenges players to complete levels to rescue Woodstock’s bird friends who have been trapped in bubbles. The game features original licensed music from the Peanuts holiday specials, and it will include events based on classic storylines and more. In honor of the Peanuts and Schulz legacy, Jam City also announced that it will make a $100,000 donation to Canine Companions for Independence, an organization providing assistance dogs for children, adults and veterans with disabilities. Snoopy Pop is just the type of interactive experience that we love, that bridges Peanuts into this new digital age. We are also thrilled that Jam City is supporting Canine Companions for Independence, a charity near and dear to the hearts of both Charles and Jeannie Schulz. The demand for highly trained assistance dogs is ongoing and growing, and this will help CCI bring additional dogs to those in need. Snoopy Pop isn’t the first mobile game based on Peanuts characters. Pixowl launched Peanuts: Snoopy’s Town Tale in 2015. This also isn’t the first branded game in the Jam City portfolio. The company also offers games based on Family Guy, Marvel’s Avengers and Futurama. Branded games allow players to engage with their favorite franchises or products, and they work to keep those brands top-of-mind when new original content may not otherwise be available. Once a branded game has been released, it can also be used to advertise new developments later on, such as the release of a new film in a franchise. 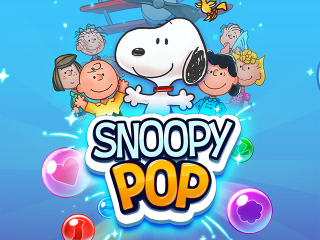 Snoopy Pop is available to download for free on the iTunes App Store and Google Play.